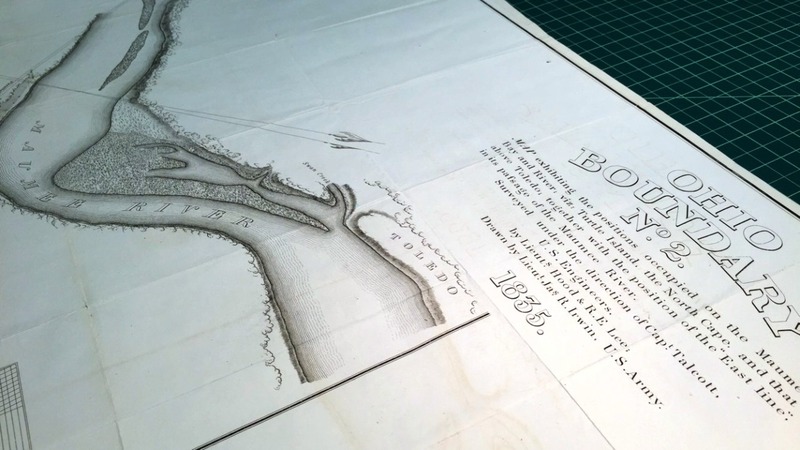 Primary Source: Wallace Conservation Lab Blog, November 11, 2015. In 1835, when Michigan was petitioning for statehood and aggressively contesting its southern boundary with Ohio (a dispute which is somewhat ludicrously remembered as the “Toledo War”), the Army Corps of Engineers formed a team to survey the disputed territory and map out proposed boundary lines. Among the men sent on this politically charged errand was one R.E. Lee, an up and coming West Point grad (who, incidentally, had just married Martha Washington’s great-granddaughter). After helping create maps which Congress used to negotiate a boundary which stands to this day, 2nd Lieutenant Lee would next be assigned the important task of clearing the channel in certain parts of the Mississippi River to improve navigation and trade, and would ultimately become a Captain in the Corps of Engineers. So it seems he was helping write bits of American history long before the Civil War. Autumn Faulkner is the Assistant Head of Cataloging and Metadata Services at Michigan State University Libraries with a secondary assignment in the Wallace Conservation Lab. She enjoys providing access to MSUL's resources, whether than involves managing projects, cataloging a stack of books, or repairing an old map so it can be handled by patrons. Her research interests include the upcoming transition of bibliographic data to the Semantic Web environment and efficient methods for creating and maintaining that data.